The truth, I'm afraid, is not far from the following illustration. Mr Solarman with his bags of 'cash from the sun'. Look on the brighter side - on the right hand side that is. The Feed-in Tariff mechanism in Malaysia actually makes it possible for you to accumulate $$. 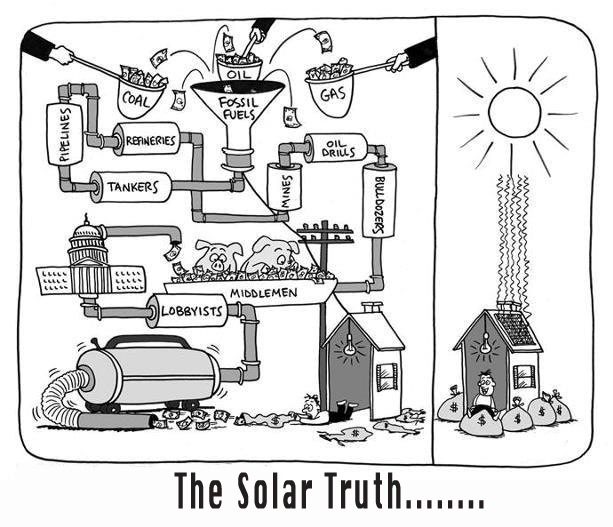 Of course not in a similar fashion as our Mr Solarman here, but you get the idea - you have a net-cash generator on top of your roof. Read about the Rooftop Solar PV scheme in Malaysia here. Alternatively, you can go to SEDA Malaysia website. i wish it were more affordable to install.